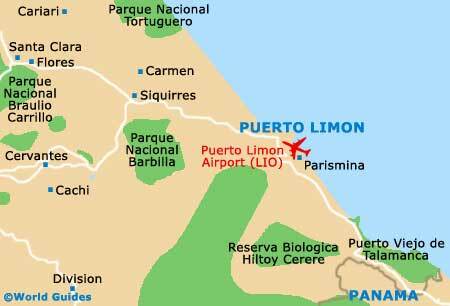 Puerto Limon's landmarks and monuments are a little thin on the ground. The harbour, once bustling with trade, is now a call for Caribbean cruise ships arriving from Miami and Panama, with its long-ago colonial prosperity a memory of a different world. A fishing fleet still operates from the harbour, giving local eateries the chance to serve the freshest and most delicious seafood anywhere on the Caribbean coast. Restoration is taking place to make Puerto Limon more attractive to visitors, with the Old Quarter being the most alluring part of town. Puerto Limon's Old Quarter is presently undergoing restoration of its quaint homes and other structures. The quarter itself, the original old settlement, is a memorial to the city's colonial prosperity. Visitors will find that the charm of its decaying streets and fading painted homes can be seen as an interesting contrast with more touristy destinations and beach resorts. Puerto Limon's Town Hall and the Banco National de Costa Rica building are both set in the city's Old Quarter, where they are amongst the most interesting buildings. The bank is a long, low structure resembling the 1920s architectural style, fronted by a green and yellow slab-paved forecourt, while the Town Hall's idiosyncratic architectural style boasts glaring blue arches. This wide colonial boulevard, now a pedestrian precinct, runs from Second Avenue to the Tajamar, ending at the sea wall with a view of Quinbiri Island. Several colonial mansions line the boulevard, which is also home to the city's Central Market. Shops and restaurants aimed at local people are to be found here, as well as food stalls selling cheap, delicious local cuisine, and various souvenir outlets. Visitors are advised to be careful of their belongings in the crowded marketplace. The imposing harbour walls are a favourite place for walks, both for locals and visitors, with the great cruise ships coming and going below. Backing the harbour in the Old Quarter are several charming old wooden buildings, which all add to the character of this area. There are a few local eateries overlooking the harbour which are good for a leisurely lunch with a view, but it is advisable to stay clear of this area after dark.